As one of Japan’s best-loved culinary creations, sushi is already pretty awesome, but it’s somehow even cooler when it’s at a revolving sushi restaurant. Being able to see the fish before you choose what to eat, the instant gratification of grabbing it right off the conveyor belt, and the high-tech fun of the technology involved, revolving sushi is an experience that’s not to be missed in Japan. YouTubers with over 100,000 followers probably don't need this kind of promotion or free food. A good example of not quite getting it. Would they call a news magazine with 100,000 subscribers and make them the same offer? 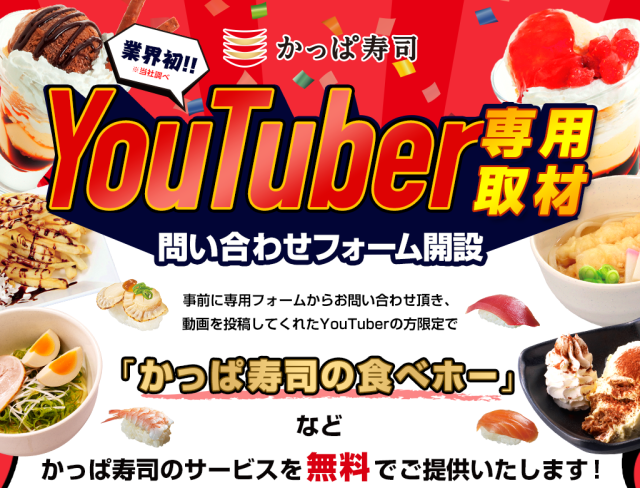 They expect to reach 100,000 viewers or more for 2000 yen worth of sushi? They expect someone to sell advertising to their 100,000 subscribers for a cheap lunch? Would be funny if one such YouTuber took the offer, and then did a terrible review and totally dissed them. I'd like that just for kicks. Hey it's Tkyosam the Gopro Sushiro guy. You guys asked for an interview during that crayzness last year. Want one now? Lets talk.